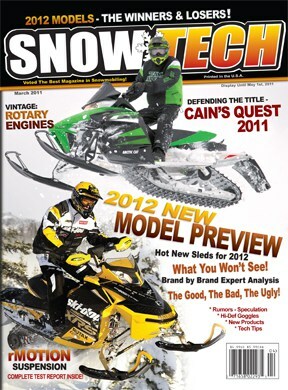 The March 2011 issue of SnowTech will be mailed on March 10th. (Allow 10 business days in the US for delivery, more in Canada) It will contain loads of info, photos, and editor opinions on the 2012 snowmobiles from Ski-Doo, Polaris, Yamaha, Arctic Cat. It also contains a Cain’s Quest Sled Build article. We’ve tested the 2012 Ski-Doo rMotion suspension and will tell you all about it. Also included are the regular departments like Industry News, Service and Tuning Notes, Tech Shorts and What’s New. Note: The previous issue of SnowTech was the Jan/Feb 2011. It mailed back in mid December.